It it’s summer, that means that kids are conjuring up all kinds of ideas of what they can do for fun. Most kids have seen lemonade stands in cartoons or books and yours may have already told you that this is on their list of “stuff to do.” They may even think it’s their ticket to a new skateboard or the latest PlayStation game. Here are a few things to consider when setting up a stand for dads trying to make every experience a learning lesson. Name the product. Branding is always important but it can be as easy as naming the lemonade after your child. Have the kids create a sign—use a piece of cardboard or posterboard as large as you can get it. Encourage them to use color and large letters to explain what they are selling. This is a good opportunity to talk about advertising, the use of color and shape to draw attention, and the importance of honesty in describing your product while making it as attractive as possible. Make a list of what you’ll need. Even at 6 years old, kids can understand that you have to buy the ingredients and cups in order to have a lemonade stand. Help them understand the total cost of the ingredients and the actual cost of goods that go into selling one glass of lemonade. Develop a pricing strategy. This is where your kids might surprise you. They may give away the lemonade “for a quarter” or even price it at $5.00 for a quick haul. You can discuss basic rules of economics like Supply and Demand, and likely find the ensuing conversation both hilarious and insightful. Consider giving part or all of the proceeds to charity. 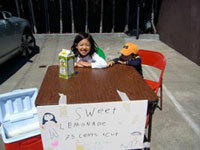 Not only is this a good sales strategy, but the kids can do a good deed at the same time.